Turkish forces are advancing in the Caucasus, hoping to recover territories lost to Russia in previous wars. They are also seeking to assist their ethnic kinfolk in Azerbaijan, where fighting is taking place between Azeri nationalists on the one hand and a motley alliance of socialists, Armenians and a British intervention force on the other. A Turkish attempt to capture Baku in August was repulsed with the aid of a British formation led by Lionel Dunsterville, but now the reinforced Turks have another go. Under the command of Nuri Pasha, brother of war minister Enver Pasha, the Turks rout the defenders and storm the city. Disorder in Baku in March saw atrocities committed against Azeris living in the city. Now it is the turn of the city’s Christian population, with Armenians in particular being subjected to massacres by the victors. In some respect the slaughter is revenge for events of earlier in the year, but it is also a continuation of the extermination of the Armenians that the Turkish authorities have been implementing over the last number of years. Germany and Turkey are allied to each other, but their goals are starting to diverge. 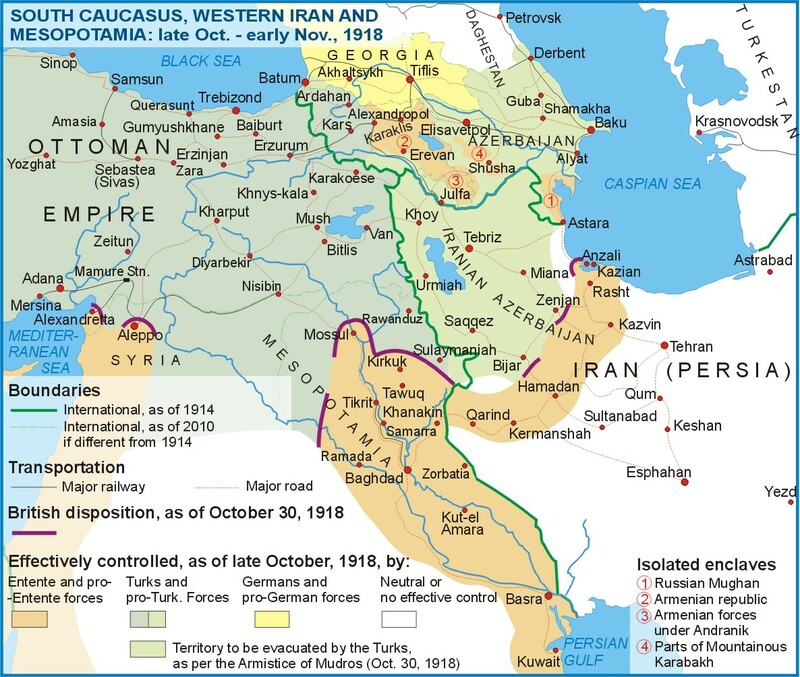 Turkey’s leaders see the collapse of Russian power in the Caucasus as an opportunity for expansion; they have sent their troops racing to occupy territory lost to the Ottoman Empire in previous wars. Enver also hopes to expand Turkish power into central Asia, where he anticipates a warm welcome from the Turkic peoples there. The Germans however want to set up friendly client states in the Caucasus, to serve as buffer between Soviet Russia and the Turks; they have already recognised Georgia as independent and despatched a small force there under Kressenstein. The problems caused by Germany and Turkey’s divergent goals come to a head today. Turkish forces advancing into Georgia clash with a combined Georgian and German force at Vorontsovka. The more numerous Turks have the upper hand, driving away their opponents and taking several German prisoners. As news of this incident filters back to the German high command there is outrage at this gross impertinence on the part of their supposed allies. Last month a new country joined the family of nations: the Transcaucasian Democratic Federal Republic, uniting Georgians, Azeris and Armenians in a federal union, together with members of other smaller ethnic groups. Today, barely a month after its formation, the Federal Republic begins to disintegrate. The odds were stacked against the federation from the start, with internal ethnic divisions exerting a strong centrifugal force. More immediately threatening is the continued advance into the Caucasus of the Turkish army, with Enver Pasha determined to restore Turkish prestige by re-absorbing long-lost territories back into the Ottoman Empire. Georgian leaders fear that the federation is too weak and internally divided to resist the Turks, so now they declare independence. A German force under Kressenstein has already arrived in Tbilisi. The Germans declare Georgia to be under their protection, preventing the Turks from overrunning this new state. With Georgia gone, the Transcaucasian Democratic Federal Republic is effectively dead. Mutual hostility between the Azeris and Armenians mean that they will not be able to peacefully coexist in a single federation. It cannot be more than a few days before the federation is formally dissolved. Today a new country emerges from the ruins of the Russian Empire: the Transcaucasian Democratic Federal Republic. The new nation seeks to unite Armenians, Georgians, Azeris and other ethnic groups of the region into one federal state. The new state’s leader is Prime Minister Akaki Chkhenkeli, a socialist Georgian from the anti-Bolshevik Menshevik party. The new Transcaucasian Republic faces desperate problems. Aside from internal tensions between its different peoples, it also faces the external threat of Turkey, whose forces are expanding into Transcaucasia in an effort to maximise Turkish power there. In the future the wayward region may also need to worry about efforts by Soviet Russia to bring it to heel.